For use on 1967 - 1981 Camaro and Frebird Trans Am. 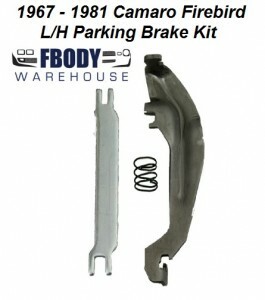 OE Quality heat treated reproduction stamped steel park brake lever kit. GM 9-1/2" rear brakes. horizontal guide bar and spring. Sold as one side.this is a the right hand side we also offer the left hand side as well. New replacement Camaro Firebird Trans Am OE Quality heat treated reproduction stamped steel park bake lever kit.